For most people, if asked to associate trekking with a particular country or region they would respond with the Himalayas, the Andes, the European Alps, the Rocky Mountains or New Zealand. These are certainly the classic trekking regions of the world, but there are some new kids on the block. One of these is Turkey. With its diverse landscapes and rich cultural history, Turkey has much to offer the modern trekker. Once a destination solely for locals and the more adventurous foreign trekker, the country is becoming better known with the opening of new long distance trails in recent years and the development of new regions for walking. Now there is much more than just climbing Mt Ararat or walking through the valleys of Cappadocia. An English woman living in Turkey, Kate Clow, has pioneered two long distance walking trails, The Lycian Way along the Mediterannean coast, which opened in 1999, and the St Paul Trail, which opened in 2004 and crosses the Taurus Mountains, as it heads inland from Antalya along the ancient route of the apostle Paul. 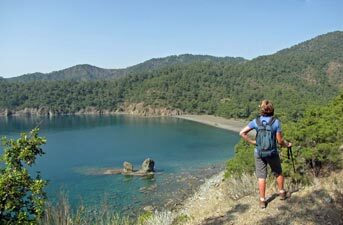 She has also set up a website Trekking in Turkey to promote these walks and trekking in general in this country. It is a marvellous source of information and we used it extensively to plan our trip. More long distance trails are being developed as I write. The Taurus Mountains, stretching 2400km across the southern part of Anatolia, themselves offer many possibilities for trekking - not only near the coast, but inland where the peaks reach well over 3000m and even 4000m, offering a real alpine trekking experience. The Bolkar Mountains and Ala Dağli massif near Cappadocia are probably the best known, but other parts of this extensive range are waiting to be explored. The Kaçkar Mountains in the north-east have gradually become better known since the 1980s and offer a very different walking experience to the more arid Taurus Mountains. Kate Clow and Terry Richardson published a guide to this area in 2008, making it easier to explore. We have wanted to visit Turkey for a long time, but circumstances conspired against us. Now we have eight weeks to finally fulfil that dream and check out the trekking options for ourselves. Eight weeks seems a long time, but it doesn't really permit a thorough exploration of all the regions and, as the fair Nello constantly needs to remind me, we are here to enjoy ourselves. There is no need to walk flat out every day. Hence this trip is a sampler of the trekking possibilities - we plan to spend a week or so in a number of areas, The St Paul Trail, The Lycian Way, Cappadocia, The Ala Dağli massif of the Taurus Mountains and the Kaçkar Mountains. This will be a mixture of self-guided and guided walks. We prefer to do our own thing, but not knowing a lot about the area, we felt it better to go with a guide in the high mountain areas. As you will see, not everything goes as planned. Our trip also includes a bit of classic tourism, such as visits to Istanbul and Ephesus etc, and a cruise on the Mediterranean on a traditional wooden boat, not to mention enjoying the food - Turkish cuisine has long been a favourite of ours. Who knows, we may even buy a carpet! We timed our trip for May-July for two main reasons:- it is the flowering season and the presence of wildflowers just makes any trek that much better, and secondly, it is just before the July-August holiday season, and the chance to be far from the madding crowd just makes any trek that much better. The following pages describe our travels and, in more detail, our walks. If you are interested in seeing the landscapes that the Turkish trekker passes through and finding out a bit more about what it is like to trek in this part of the world, please join us.